I drew a new pattern today - which I won't describe because I might use it for the Yahooker swap, instead of the one that required so many color adjustments. I needed antique black wool for the new pattern, but if I have any, it's out in the barn and I just didn't feel like walking out in the bitter cold to find it. I had some wool jackets and coats down in the basement, so I picked four of them, cut off a sleeve from each jack, and threw them into a dye pot. 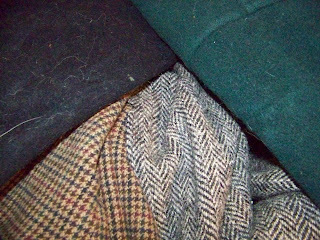 There was a dark green, a black and white herringbone, a brown and red tweed, and a black. The dyepot already had some leftover red dyewater and some dish soap in it. That one sleeve was probably black, but I'm working in such week light that I could be wrong, it could be navy blue. 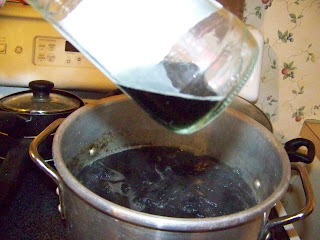 I was finally pretty sure it was black when the water in the dyepot started to change color. I checked the color of the dye water by dipping a jar into the pot and holding it up to the light. After more than half an hour of simmering, the color was still very weak, so I figured I needed some more black, but I really didn't want to cut up any more of that black jacket. Then I remembered the sleeve linings - two of them were black and I had just thrown them away. I retrieved them from the waste basket and added them to the pot. About fifteen minutes later, I had a strong black in the dye water. I added a couple glugs of vinegar, and let the whole pot simmer for another half hour. Patient dyers will remove a dyepot from the heat source and let it cool overnight - but not me. I singed my fingers by turning the faucet in the kitchen sink to as hot as I could get it, and then removing the wool from the pot to rinse it in the sink. 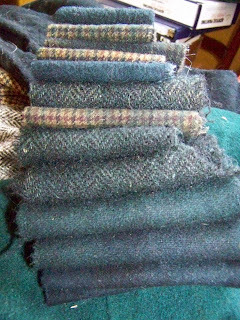 The wool was really dyed black, only the two pieces of brown tweed showed any of the original color - at least while it was still very wet. I laughed to myself as I hung the pieces in the basement - I'll let them drip dry until morning, then I'll put them in the dryer. The laughing was because I was thinking about Gene Shepherd's blog and his beautiful yards and yards of wool hanging out to dry in his hot California sunshine - and here I was quite pleased with my colorless wool in a dark and creepy Michigan basement. Sunday morning: Here is the finished antique black - the camera makes it look a lot lighter than it looks to my eye, maybe because it's sitting on a green jacket, but it isn't the dull sooty black that it looked like when it was wet. There is a nice variety of texture that I'm going to enjoy. Now I'm ready to strip it and start hooking! Phyllis, What a great bundle of wool! Don't you just love hooking with recycled wools? I know I do. Hey, the other day you were talking about "being of service" after watching Obama become president. I saw this and thought of you. 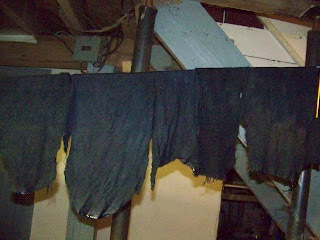 By moderating Yahoo hookers and even posting this post about dyeing antique black you are being of service!! As a very chicken dyer, seeing the casual way you handle dying, makes it seem not quite as scary. 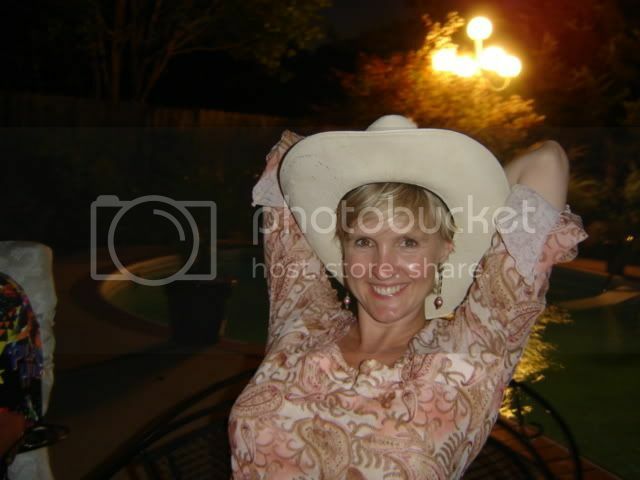 Thanks for your work here and on Gibby's blog. Thankyou, I would love to show you what the antique black looks like now that I've hooked with it - but I used it for my Yahooker swap trivet and I shouldn't let anyone see it until my swapmate receives it. I am feeling surprisingly confident that I'll get it done on time - I'm about 3/4 of the way finished with whipping it.